It was Friday morning, November 2nd and the alarm went off at 4:15 a.m. This was a typical morning for me. I wake up, brush my teeth, throw on my clothes and head to HQ, but this time I wasn’t going to administer a man-to-man conversation or help out with Class 003. No. When I woke I was heading to HQ to kick off Crucible 003. A year previous my stomach was all tied in knots. It was my very first Crucible to program and execute. Nine men’s lives were left in my hands. All nine men entered and all nine men would come out the other side reborn. All nine would be safe and get to go home to their families. This time would be no different. Although I had butterflies in my stomach, I was more confident this time around vs. when Class 001 went through a year ago. I was battle tested and I should have been more confident. I have the best medical staff, the best Cadres, and I know the men extremely well going into the Crucible. But everyone has a plan until they get punched in the mouth. Class 003 had a plan, but soon we would find out how they would respond to the punch. And myself, my team, and everyone evolved better be ready to adapt and adapt quickly, because one thing is for certain, our initial plan would never survive first contact. It’s hard for me to explain the feeling when you walk into HQ the morning of the Crucible. For almost six-months you have witnessed men bear their souls to one another, share in adversity with one another, and do life with one another. The event isn’t just your run of the mill endurance event where you show up earn a patch, medal, or even a t-shirt. It is interlaced with deep meaning to the men who chose to go through it. It is about sharing in each person’s individual WHY, making it that much more special and finishing what one started. This is why the Crucible is so powerful. Men laying it all on the line for each other, for their family, only to be stripped down to their rawest emotion and character. The ultimate mirror test. As the men went through their routine med checks, I did what I normally do, I watched how they were dealing with the stress they had placed on themselves. All week long, psychological warfare was executed to see if the men would turn on each other, get over-hyped, or turn on the Cadres who helped them get to where they were. And it worked. Several of the men leading up to the event found themselves speculating, planning, only creating that much more fear and chaos in their mind. And on this morning we were going to watch it all unfold in front of our eyes. Facing in front of the large flag against the back wall, I addressed each man one-by-one, requiring him to express his WHY to his team and to the staff. The exercise is simple – let’s judge a man by his heart, not by his physical dominance. And from my experience, a man who has a shallow WHY or a selfish WHY eventually fails out, or his team (this includes his family) turns against him. As expected, each man, as trained, had a WHY that ran as deep of a one-hundred year old oak tree. Strong, grounded, and deeply rooted in character. But one thing was different with this Class vs. the previous Classes. It wasn’t hard to see. This Class posed a challenge. They were the most injured. But each of them stood tall and ready to take on the 60-hour Crucible which is designed to break and remake men from the ground up. It seemed as I went down the line, every man had something they were dealing with physically. I, along with the staff, was expecting a minimum of a 50% drop ratio and we only had 8 men going through the event. When the Class originally began, we had 33 and now only 8 were ready to finish what they started. Once we got through the SoP’s (Standard Operating Procedures) and general discussion, it was time to test their character and one of the best way to do that is injecting stress. Shortly after a quick breathing session took place, the Cadre’s arrived. Our first two Cadre’s were Retired Navy SEALs, both who served over 20 years in the TEAMs. And when they arrived, unnannounced, they had strict instructions – create chaos, conflict, and tension. Once I saw them enter the door and find their place right behind the candidates, I slowly had the men turn around to get warm, and then it happened. Chaos fueled by bullhorn beeps, loud voices, bags being dumped out, ice baths, countless push-ups, and commands was had Class 003 on edge and it was only an hour into the Crucible. The men struggled to keep up. You could tell their fuses were blown from the beginning. Men who were once a team, were now individuals. Men who vowed not to break up the team mindset, did once we turned up the heat and we were less than an hour in. The Cadre’s and staff have one goal and that is to help man realize his truest self. It is not to push him beyond the brink where it is dangerous. Instead, it is to lean a man off the side of the cliff to put the fear of God in him. This was 003’s ledge. And the greatest thing is that every Crucible is different so the little intel they received from 001 and 002 was worthless. 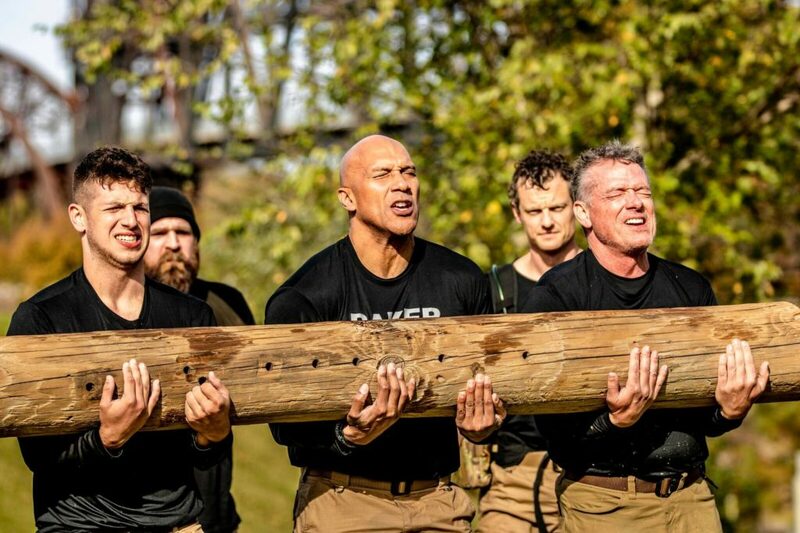 As the morning unfolded the men of 003 were in and out of the Arkansas River (it was cold by the way), given simple instructions as a team, which they failed, made themselves into sugar cookies, had executed Log PT. They were cooked. Very little food. Wet, cold, and staring down 54-more hours, we eyeballed our first quitter. It’s important to note at this point in the journey how one can quit. He can either (a) ring the bell three times (b) say “I quit” to the Cadre or (c) have his issued SoM patch ripped off by a Cadre or he do it himself. And trust me, we want the patch. When I arrived I just remember seeing Tanner Austin, 20, cramping and yelling, “I am not going to quit. I won’t quit.” He was the one I honestly wasn’t expecting, but something powerful happened. Kevin Kelly and his team rallied around him. All of them were in shell-shock, but to see the youngest on the team battling mentally and emotionally was a good sign that the first piece of the emotional layer was being stripped back. Several at Pinnacle were ready to call it quits. Baker struggled with hydration, Austin with cramps, and when they headed up the mountain they had a wreck bag to carry (50lb bag) and they had to meet a time-hack of one-hour. On the way up, it showed that each man wasn’t willing to pull his weight. Two of the men were clearly carrying the majority of the load and when asked for help, the other men were reluctant to help. Instead of working together and figuring out a system, they went at it alone. And the last time I checked a war wasn’t won by one man. Once the day came to a close, the men were morally low and physically drained. The only thing that saved them was the Friday night feast where we bring in the families for dinner. It is the 14-hour mark and is welcomed by everyone, most importantly the candidates. It is amazing to see the transformation of the men from morning to evening. From being able to walk, to blisters forming on their feet. From high-energy, to being low. Friction, chaos, adversity taking their toll on man’s mind and soul. This is the Crucible. Now after eating a full meal, we let it sink in and they get tired as they go into the night, but before I turned it over to the night shift, I had one last evolution. A man-to-man conversation. When a man is tormented, beaten, and broken, he is at his most vulnerable state so I made everyone grab a chair and we talked about one topic that is rarely discussed – suicide. At the time, there were only eleven of us in attendance, including Class 003 and when I asked, “Has anyone in this group contemplated or attempted suicide,” a staggering number of hands went up. Seven out of eleven men had. I was shocked to say the least. Each man went through their experience and there was not a dry eye in the house. This is the heart of the SoM. Getting to man’s heart and sharing in the pain with him as he worked through his demons. And most importantly, the men were not expecting this part of the event. Hell, I wasn’t either. Breakthroughs were happening and the men didn’t realize it. When man is authentically vulnerable, he draws his brothers closer. I knew at that point heading into day two the men were ready to have a date with destiny, but first they had to make it through the night and see the sunrise to know they are one-step closer to earning the coveted Phoenix.